Our standard stage sections are 4ft. x 8ft. x 16in. tall. They may be assembled in any size in multiples of these sections. (example; a 16ft. x 24ft. stage would require 12 of the standard sections). Most stages are set up using optional carpeted steps to provide safe access with minimum opportunity for slipping. 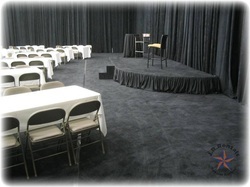 Most stages use optional skirting and carpeting to provide a professional appearance. 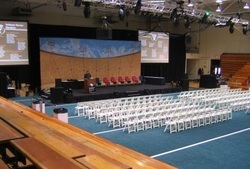 "D" shaped stages are custom, please call (317) 539-7440 for a quote. used the optional stage steps, black carpeting and black skirting. This 16ft. x 12ft. 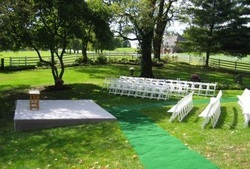 stage was custom built to provide a level surface for a wedding ceremony. The front of the stage is 4in. tall while the back is 14in. tall. It was covered with an optional gray carpet.